In my working life, I have had some moments of pure, unexpected luck. And those moments have, without doubt, made me look a lot smarter than I actually am. Thank you Lady Luck! Please drop by again soon. So my interest was piqued when I was listening to Professor Cade Massey of the Wharton School talking about how we evaluate the performance of our employees. And, in particular, how we should distinguish between the skill/effort of our employee and how lucky they are. You see, great outcomes are not always the result of high levels of effort or skill. There is normally an element of luck involved. And by luck, he refers to factors outside of the employee’s control – competitors, team members, their boss, the economy for example. Professor Massey says ‘our challenge is separating skill from luck’. He refers to luck – or things that cannot be controlled by the employee – as noise in the performance measures. Are we assessing our new hire’s performance fairly? So this made me think about how we assess the performance of our new hires. You see, when we look at the performance of our new hire, our automatic assumption is that good results mean a smart hire. When we see poor results, we start questioning our hiring judgement. But don’t be too hasty. If we take Professor Massey’s advice, we shouldn’t be evaluating performance purely on things that can be heavily influenced by factors outside of your new hire’s control. So maybe those good results were not due to the skill or effort of your new hire. The economy might have turned at just the right time for him. Perhaps he has joined a team that were willing to carry a lot of the load. So he may have utilised only a little skill or effort and still got the great outcome. Maybe he was just lucky. Why care if the good results are due to skill or luck? Your new hire might be good. But is his initial success thanks to his skill and effort? Or does he have a little bit of luck on his side right now? And do you care? Good is what you wanted, right? As Professor Massey succinctly points out: Skill persists. Luck doesn’t. Bizarrely, this early luck may end up with you losing that employee that started with such flair. Let’s take an example. You bring in a new sales guy. He smashes expectations and brings in two big new deals in a matter of weeks. Of course, you are ecstatic. But what you may not notice is that one was just pure luck – a customer that was desperate. And one was from a previous contact of his that he had already been grooming. He hasn’t really followed the proper process. But, hey, he’s bringing in the money. Why should you worry? Well, next quarter he may not get lucky, and soon he will run out of warm contacts. So you need to make sure he knows the processes to follow for when times get a bit tougher. His ability to adapt these processes should be included in your evaluation of his performance. And it’s hard for that new hire who shone so early on to see his performance dip. He may become despondent, demotivated. And sometimes that is a tough place to come back from. 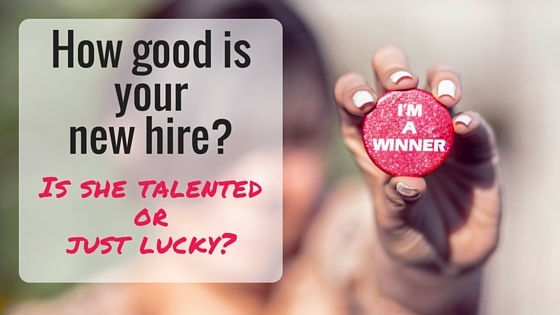 When evaluating your new hire, you need to separate the skill and effort from the luck. If you assume he is great too early on, you may take your foot off the gas in terms of nurturing that new hire. Early successes he has may make you assume he has got it all sussed out. So you are less diligent in the training (he seemed to be picking it up so quickly!). Perhaps you put less effort into helping him build up his network of contacts that would help him through the tough times. And what about the new hire that has bad luck? And of course there is the other extreme. The new hire that looked really promising but has disappointing results. But let’s look at the factors outside of her control. Perhaps she is being let down by the team around her. Or the product she is trying to sell is already struggling in the marketplace. Or her boss is not the best people manager on your team. She may, in fact, be working really hard and following the process to the letter. But outside influences are blocking her way. So be diligent about looking at the process rather than the outcomes. What are the fundamental drivers that result in the outcome you want? Professor Massey uses the example of an ice hockey team. Not many goals are scored in a hockey match. So how valuable is it to measure performance based on a rare event? Especially an event that can be impacted by luck. A shot that can be destined for goal can rebound of someone’s blade and go wide. Or vice versa. So hockey teams started to focus more on the process and drivers that could result in a goal. They started measuring numbers of shots on goal. And then they included the amount of possession a player had. Because more possession resulted in more shots which led to more goals. So going back to our sales example above. You will know what processes drive sales in your business. So with your new hire, you should be looking at their ability at the process level, rather than just the outcome. Are they bringing in the bids that could result in sales? Are they developing the right number of relationships to result in the bids? Are they making the contacts from which they can develop those relationships? Make sure your new hire is developing his skills in those processes – these are the things that will help him succeed moving forward. Think about your favourite sport. And consider the teams that win the top prize. Those teams that consistently do it, season after season, are skilled as a team. When measuring performance, it’s important to separate what your new hire can directly control and what they can’t. A higher level of uncertainty in the environment will mean the less control your new hire has on the outcomes. Your focus should be on the processes that could lead to a good outcome, rather than the just the outcome itself. Don’t just look at the results, look at how they got there. I have quoted Professor Massey from the excellent People Analytics course on Coursera.